Another Monday and another prompt for you. And because my US friends will be celebrating Thanksgiving this week, I'm going traditional. I'd like you to be inspired by blessings. I know that many of you undertake some sort of thankfulness project in November or at your Thanksgiving table so you might like to consider this as your contribution this week? I know that I've made layouts about things I'm thankful for in the past but will you want to take this in a slightly different direction perhaps? 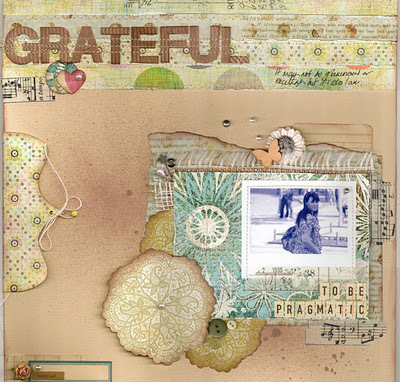 This is the layout I made for challenge #15 where Pam asked us to be grateful for something about ourselves. I consider my pragmatism a blessing. You can either upload your layout into the Whimsical Musings Flickr gallery with the tag WM#238 or you can post it in our Whimsical Musings Facebook group. We've decided that we'll save albums for special occasions so just load up your photo to the group with the tag WM#238 in the write up text so that we can find it.